Lots of changes as I’m trying to wrap up the structural portion of this project and move on to painting… The electronics are done, new “power cables” are installed. Hand casting is done (though there’s still some cleanup to do) and I’m sealing up the last few assemblies that were kept un-glued for the sake of the electronics. 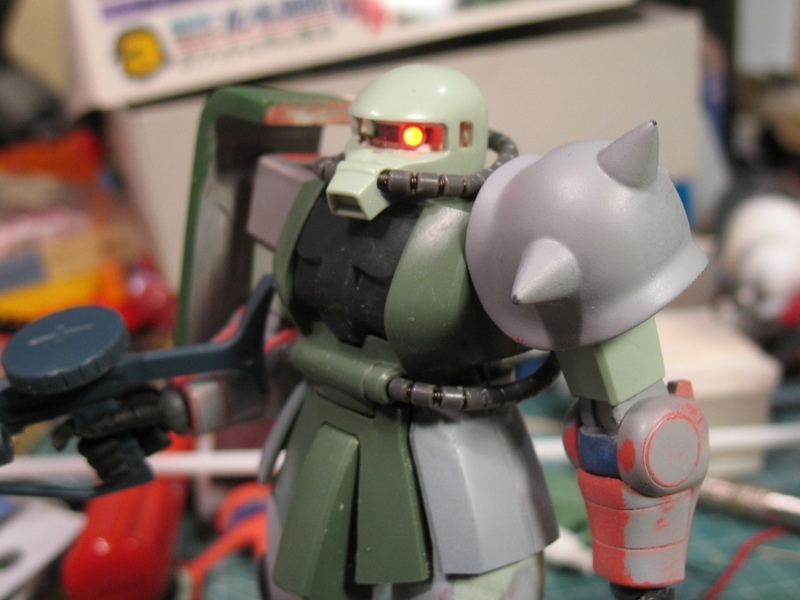 Pretty much all Zaku kits released since the MG Zaku have included some kind of holes in the skirt armor to plug accessories into. Some are implemented better than others. 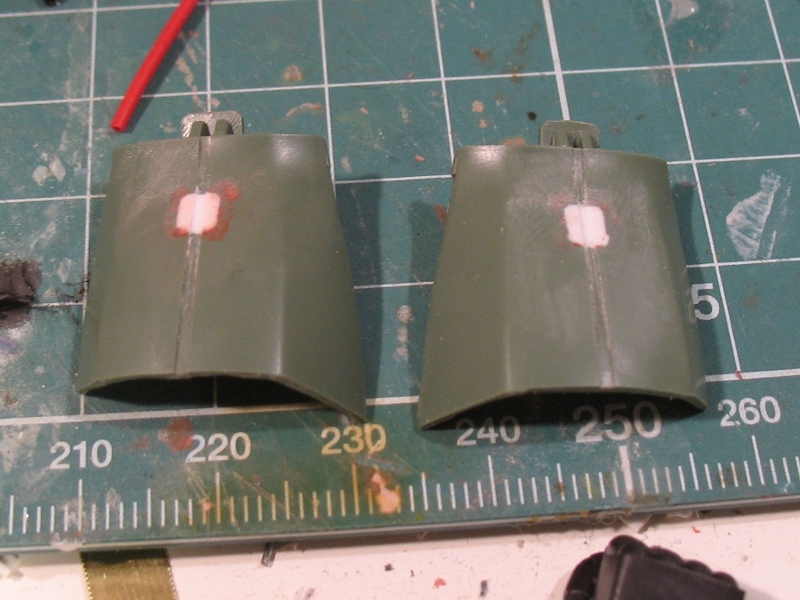 These ones are pretty bad: 3mm round holes in the side skirts… There was never any question of whether I’d fill in the hole and panel over it, the only questions were when and how. 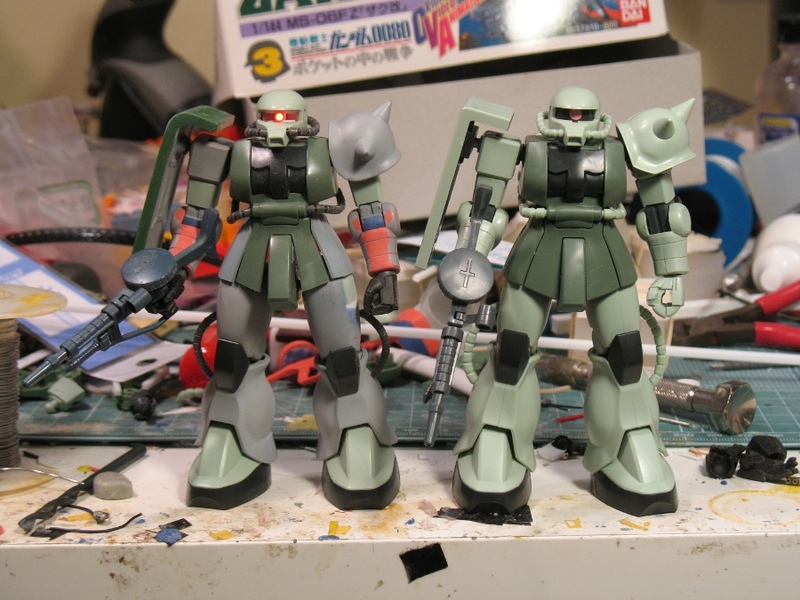 This is the third time I’ve done this mod to HGUC Zaku skirts: this time around I filled as much of the space as possible with styrene rather than using other materials. The hole was filled with a 3mm styrene rod and the opening around the hole was paneled over with a piece of styrene plate cut to size. Once the plate was glued into place, I carved out the channel that’s present in the surrounding areas of the part. The seams didn’t disappear right away: after the first try priming the parts I had to putty the seams and try again a couple times. 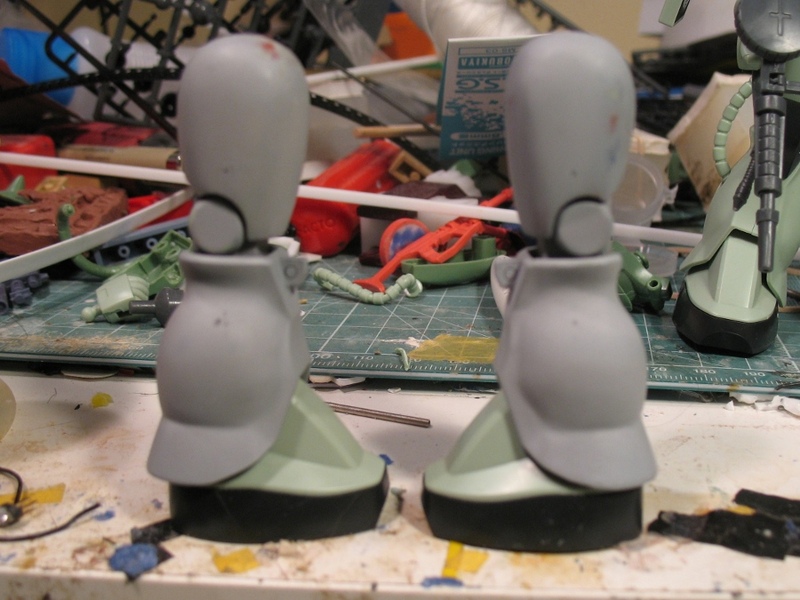 The second photo shows a comparison of the modified left and right legs. Some differences are apparent in a photo like this: the right leg has more pronounced curvature. 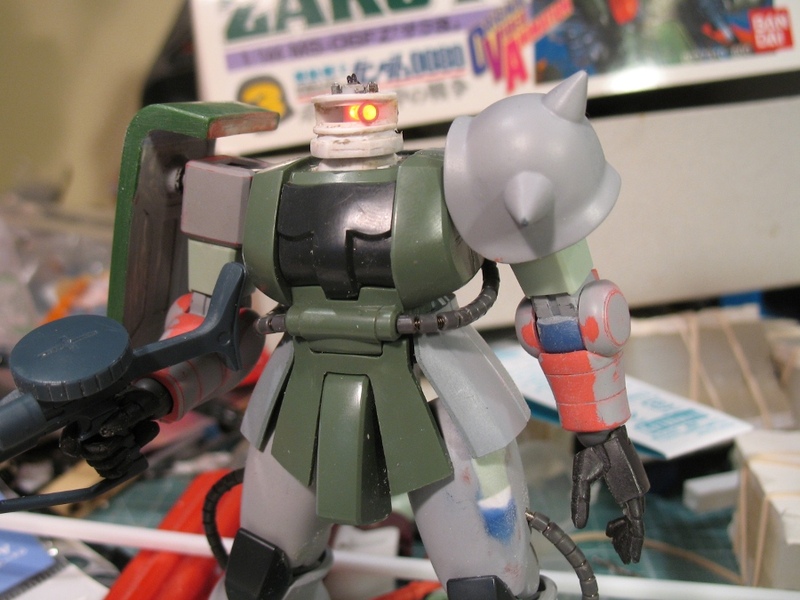 I don’t think it’ll be too noticeable on the finished model, though. 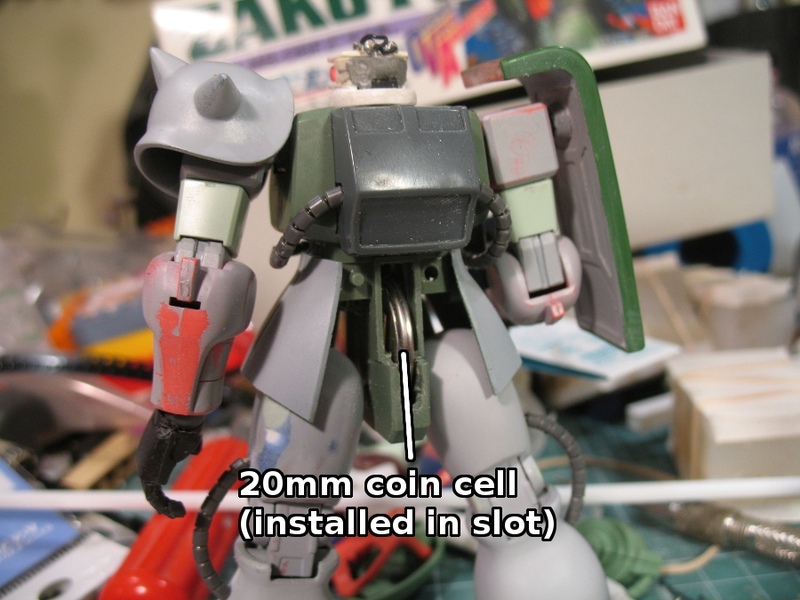 I think the lesson I’ll take from this is that the way I tried to do the mod (using SGT and epoxy putty to fill out the surface after inserting styrene plates to change the length or width of parts) probably isn’t the best choice. Next time I try something like this I’ll probably use polyester putty instead. 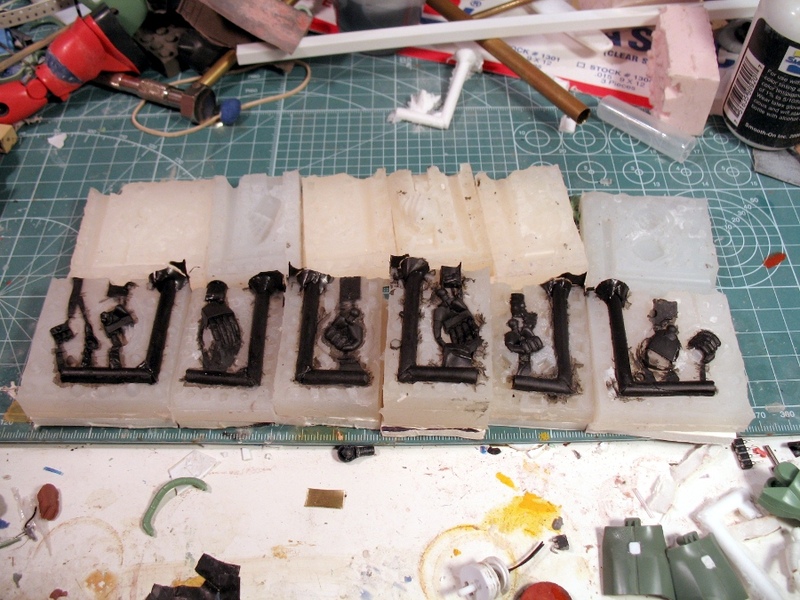 It took me a while to create useful molds for recasting the B-Club hands I wanted to use for this project, but it’s done. 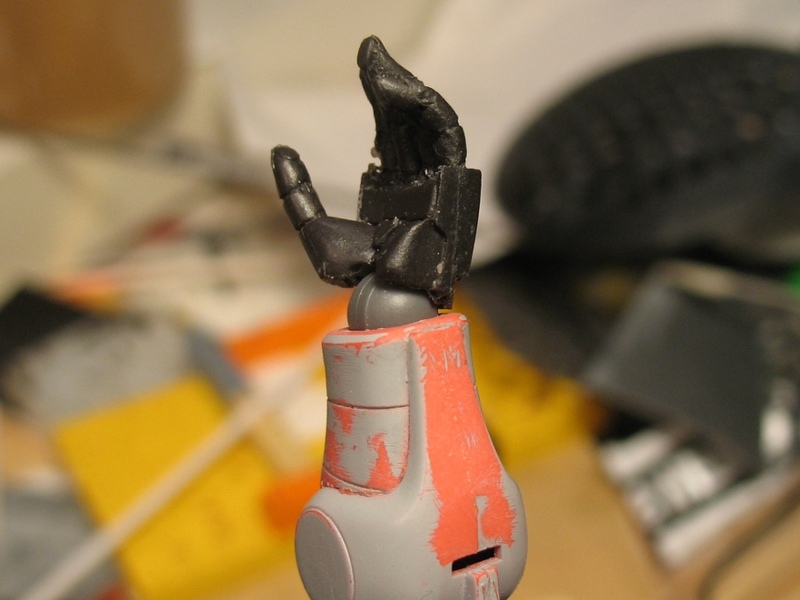 There were some mishaps along the way and one of the molds (the gun-hand) will need to be redone at some point, but the cast hands look good enough that I feel pretty good about using them. 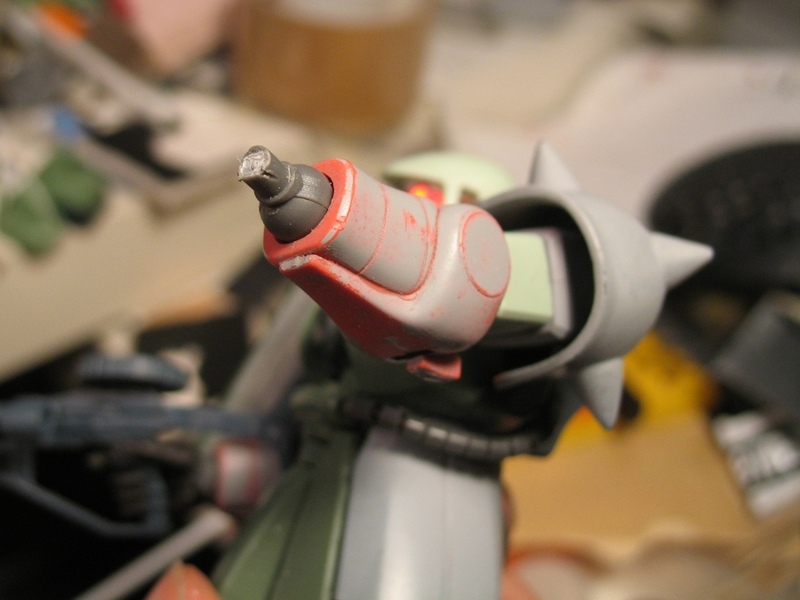 After casting the hands I modified them to use a Kotobukiya “HIPS” joint (a spherical hinge, kind of like Revoltech joints) for the wrist joint. 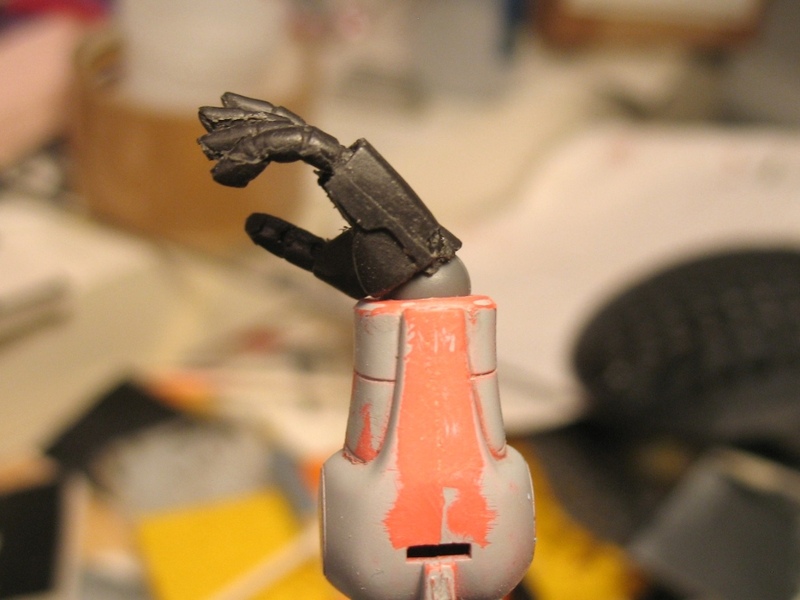 The main motivation here was to improve the look of the wrist joint: the typical “ball joint on a stick” wrist joint looks pretty flimsy, especially in any kind of pose. 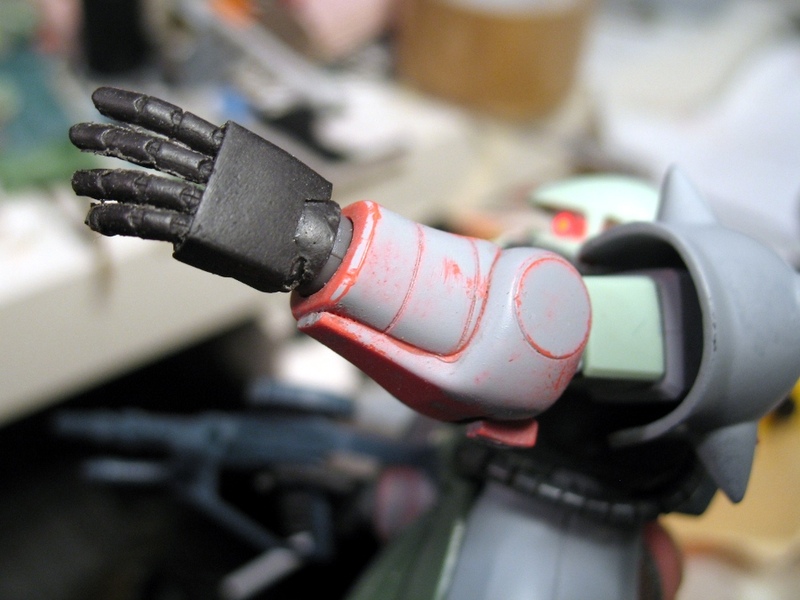 The HIPS joint is closer in size to both the hand and the forearm, so there’s no appearance of a “gap”. 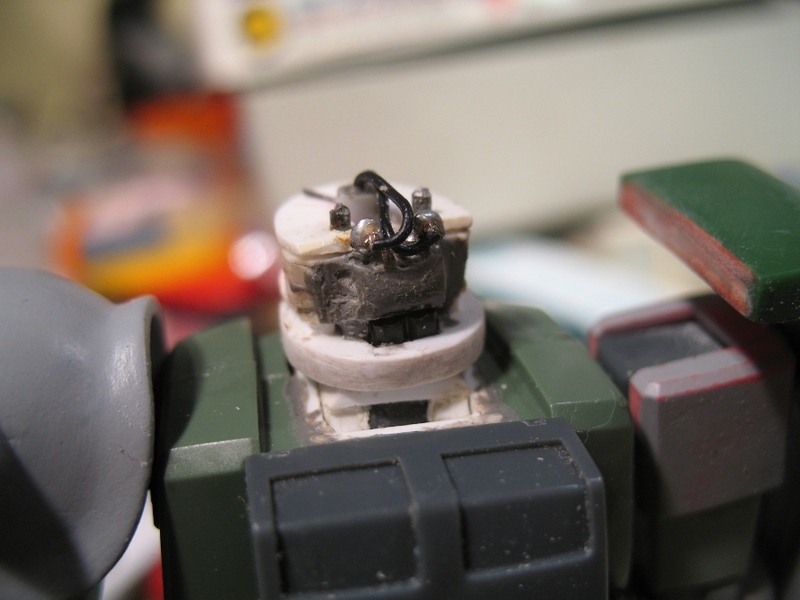 First up is the head interior. 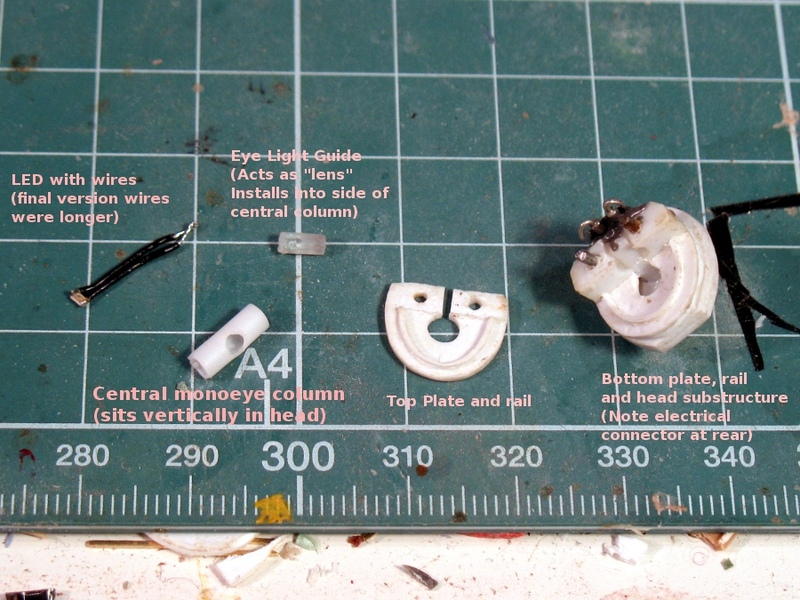 The basic monoeye assembly consists of two plates surrounding the monoeye area. On these some curved plastic “rails” are mounted. Through the whole thing runs a rotating vertical column with an LED embedded into it: and attached to this column at a right angle is a clear part that serves as the eye itself. 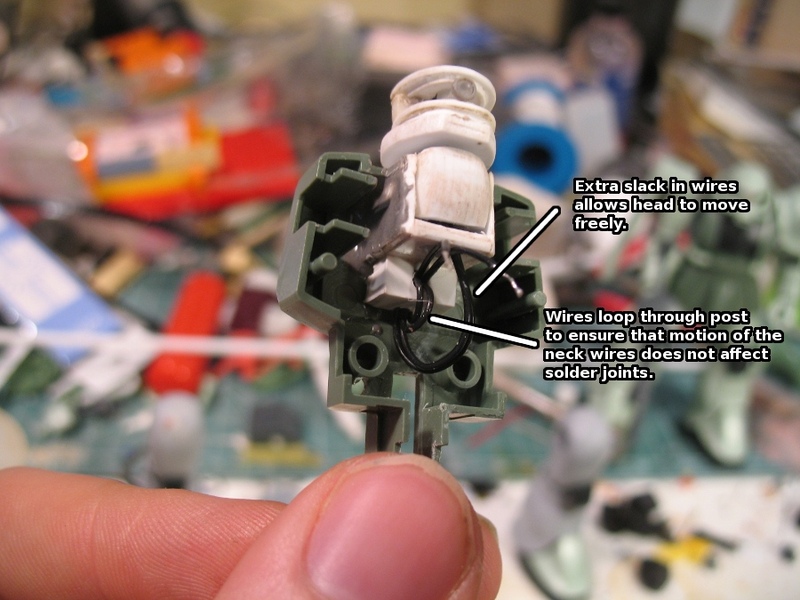 The wiring connection to the head is modular so the inner part of the head can be removed for painting. Modularizing the electronics also makes it easier to deal with everything: you can wire things up and have them very self-contained, and then connect them together later on. 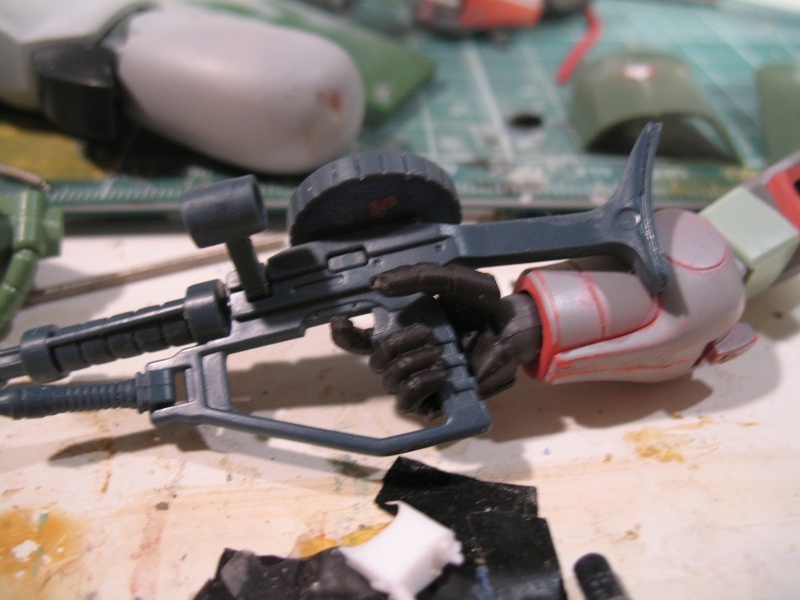 My early designs for the monoeye assembly had the eye poseable via a screwdriver slot at the bottom of the head. 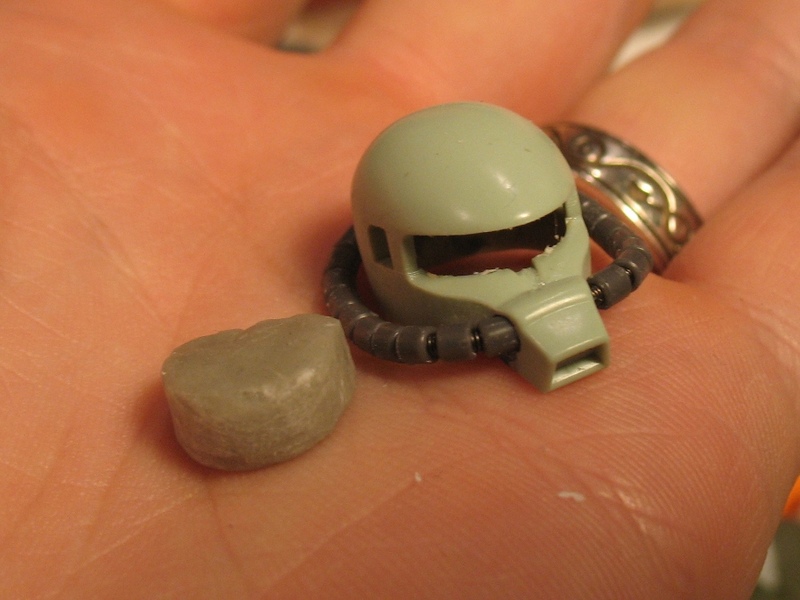 I decided this was going to be too fiddly, requiring the removal of the whole head any time I wanted to move the eye – so I came up with a new scheme where the kit head is turned into a hollowed-out “helmet” that slides down onto the inner portion of the head. 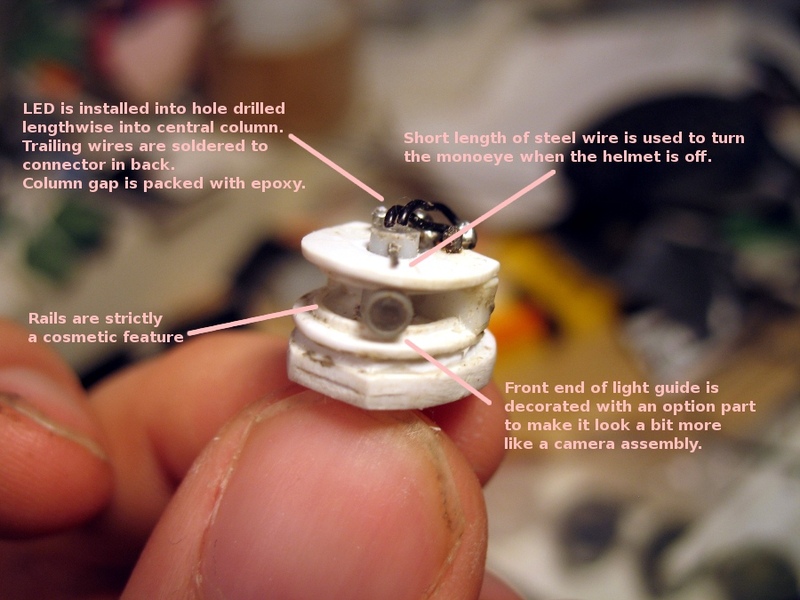 To pose the eye I added a steel wire coming out of the center column: to move the eye left or right I just slide the helmet off and move the steel wire one way or the other. 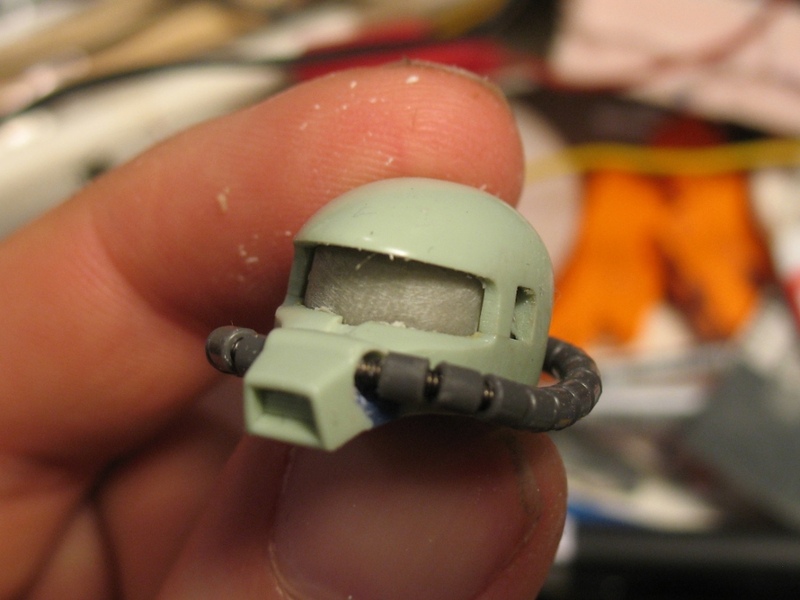 I’ve also started on a clear visor that will be mounted to the interior parts of the head. 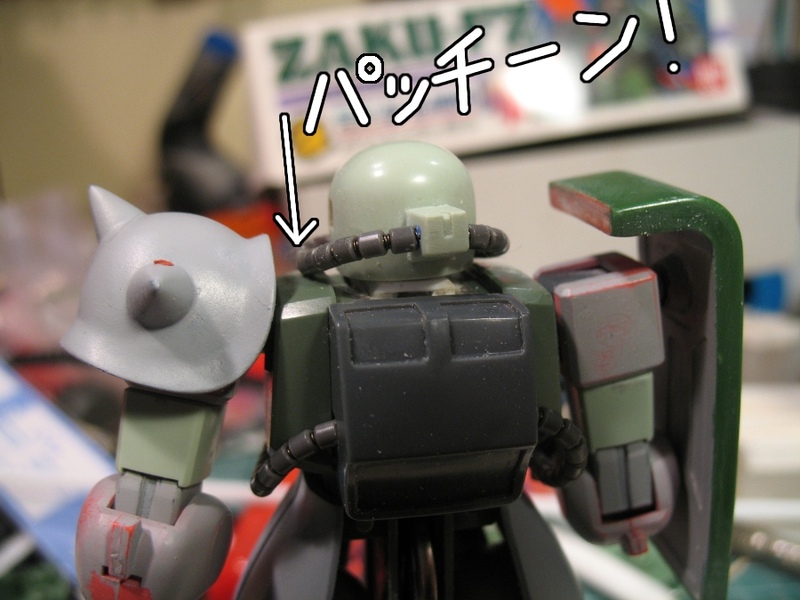 I’m going to vacuum-form the part: to get the form I need for vac-forming the visor, I stuffed the interior of the head with epoxy putty, and pulled the putty out before it had completely hardened. After some refinement the part will be ready for use in vac-forming a clear visor part for the model. One of the big challenges for me personally when wiring a project like this is keeping the wire connections from breaking due to wires getting shifted around. 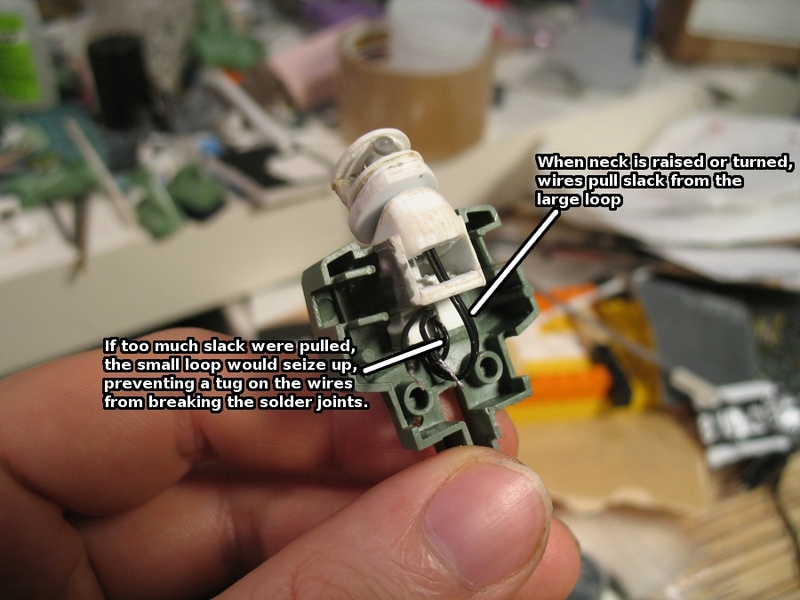 Even just during the process of finishing the wiring, connections made earlier in the process may get wiggled around enough to damage them. 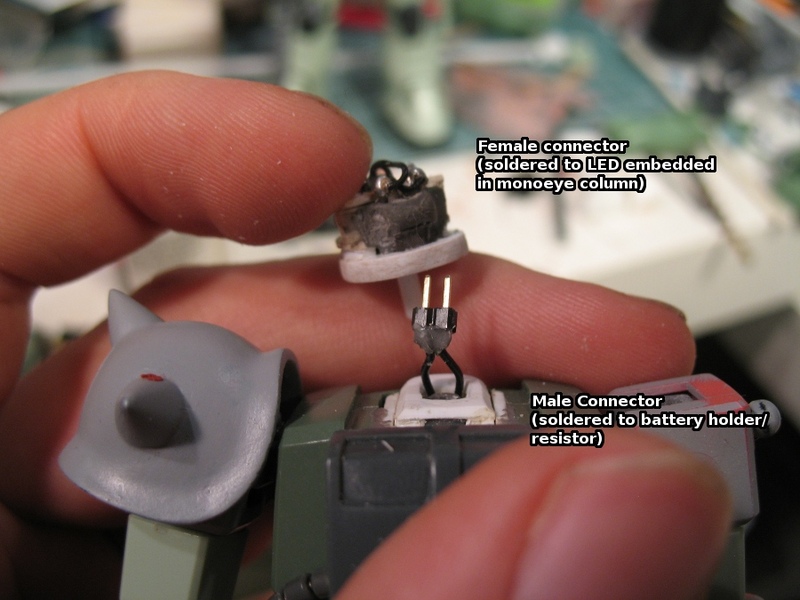 On the second or third try at wiring the torso, I protected the connections to the battery holder and power jack by embedding the wires in epoxy. 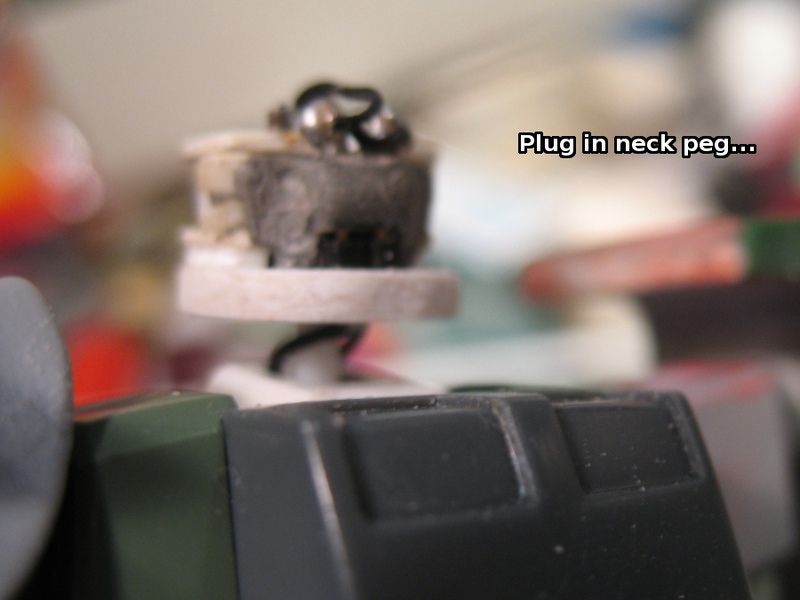 But there was still the problem of the neck wires: they’re bound to shift around when the neck is raised or the head rotated: to keep that motion from breaking wiring connections, I came up with a scheme in which the wires are looped through a styrene block to keep motion of the wire ends from affecting the connections to the other portions of the circuit. I wasn’t sure how I wanted to power this model: lately I’ve been feeling like I mostly want to go with external power sources, just ’cause coin cells are really expensive for what you get. I think it’s generally better to hook up the model’s lights to an AC adaptor, or a pack of AA’s mounted in a display base. 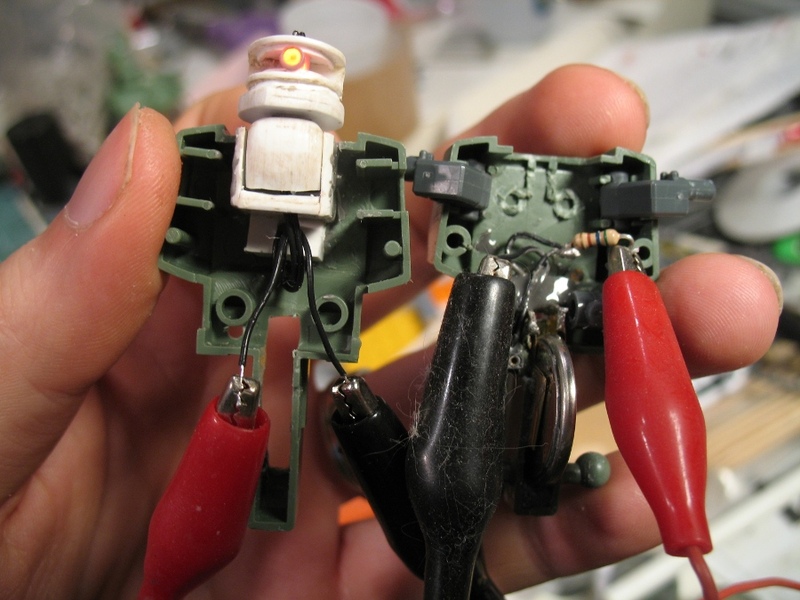 But internal power is very convenient as well, so I decided to experiment and see what I could come up with. In the end I wound up instlaling both a battery compartment and a power jack for hooking up power from outside the model. 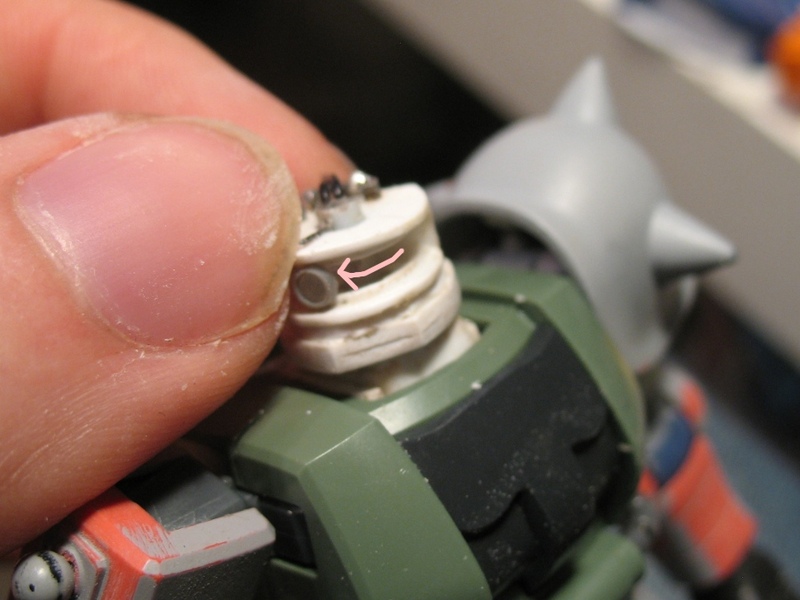 I made space for a 20mm coin cell in the hips of the Zaku by cutting out the snap-fit connections there as well as other support material. Obviously one danger of this approach is that it may leave the hips vulnerable to breakage, since I removed some of the support material that holds them together. However, I wanted to give this mod a try. Assuming the hips hold together it seems like a nice way to go: a good amount of power, a very accessible location (via removing the rear skirt), and it wasn’t too tough to do. Finally, I replaced all the kit-supplied “power cables” with beads and springs using Kotobukiya Mobile Pipe for the “beads”. 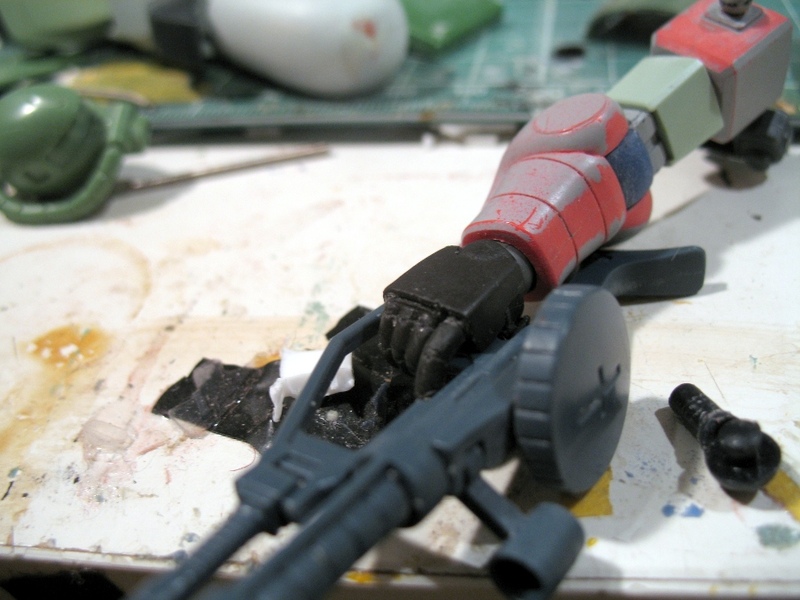 Unlike most of my Zaku projects, I opted to give all the cables the same outer diameter. I used the 2.5mm beads on the waist cables first, and really liked the look. Sometimes I think throwing in some slightly undersized features can make a model look more refined in its detail. I had thought about using the next larger size of Mobile Pipe for the leg cables, but the difference in diameter between the smallest and second smallest size is pretty great: I thought it was too much, so I made all the cables the same diameter instead. I had to pick all the 2.5mm beads from five or six Mobile Pipe sheets to get all the beads I needed. 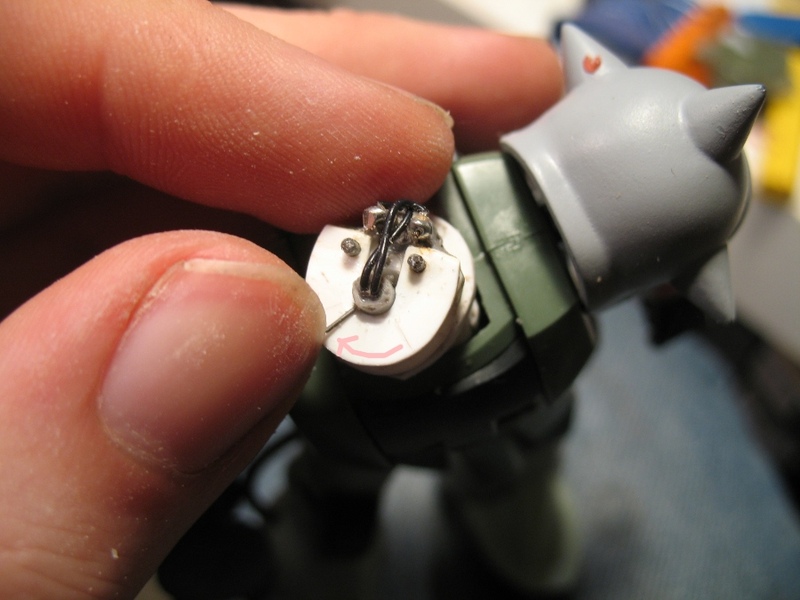 :) I think one of these days I really must take a crack at casting Zaku power cable beads instead of relying on Mobile Pipe or other aftermarket options… But I think the waist and head cables look great, and I think the leg cables will probably look great as well once I get them properly installed. One thing to note about the leg cables is that I drilled the installation points myself: the endpoints of the leg cables are not the same as on the stock kit. 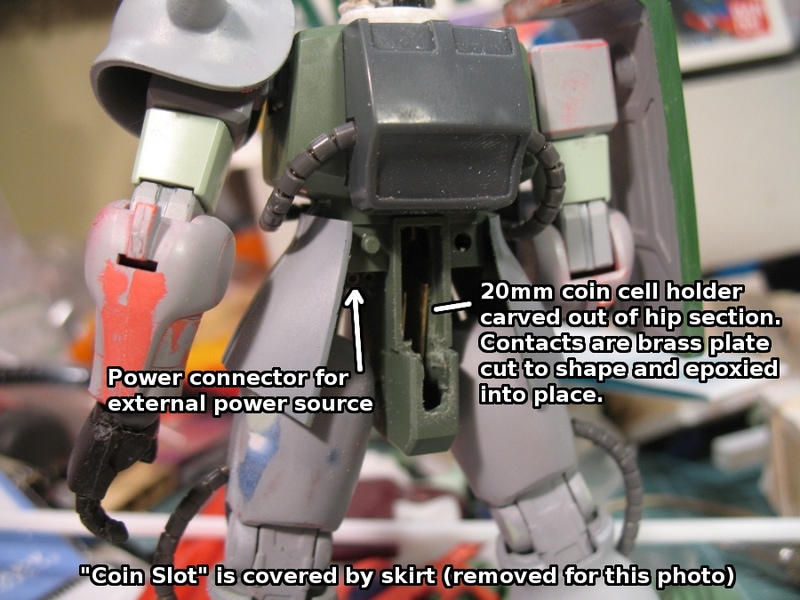 This is partly because the original location of the cable endpoint was cut away during the lower leg mod, partly because the original location was itself a bit of a compromise (IMO) to accommodate an inflexible cable part, partly just because I was interested in building a Zaku whose lower leg cables weren’t too much longer than they really needed to be. (Think about it: if that cable is just there to get something from one side of the knee joint to the other, it really doesn’t need to be very long at all.. Just long enough to have some slack to accommodate different knee bends..) I tried to match up the drill points on the first try, but they came out a bit different, and so I had to fine tune ’em a bit. I think the current locations are better matched up between the left and right sides than in the initial attempt, but I think it’ll be hard to say if it’s good enough until I get the cables installed properly.